*There was a time - and it wasn't that long ago - when the NEW JERSEY Meadowlands were an undesirable place for just about anything other than an AM radio transmitter facility. From the 1920s, when stations like WOR and WLWL first built sites there, to the present day, the swamps just across the Hudson River from New York City have been the preferred spot for AM broadcasters in the nation's largest market. With the construction of Giants Stadium in the 1970s, the Meadowlands began to become desirable for other uses, too, and in recent years, the area south of the stadium complex has become a hotbed of development. WOR, as you'll recall, is losing its current site in Lyndhurst to the massive EnCap golf course/housing development that's being planned for 800 acres in East Rutherford, North Arlington and Lyndhurst - and now two other AM stations in the neighborhood are crying foul about what they say will be detrimental effects to their signals from the EnCap project. 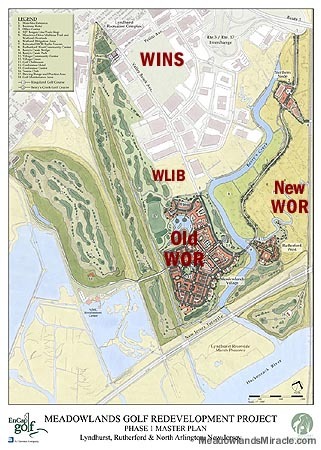 WINS (1010) and WLIB (1190) tried to prevent the New Jersey Meadowlands Commission from granting its approval for Phase I of the project, arguing that planned 15-story apartment buildings would disrupt the stations' directional patterns, making their transmitter sites unusable. The matter will now go to the New Jersey Supreme Court, where WINS and WLIB hope to get an injunction to keep construction from starting on the housing portion of the project. It promises to be an interesting fight, and we'll be keeping tabs on it - stay tuned! *Down at the other end of the state, Multicultural Broadcasting is testing the new transmitter site of WTTM (1680 Lindenwold), and for the moment, listeners down there are hearing "T.E.D." That's engineer Neal Newman's "Timeless Entertainment Device," and it's out-Jacking "Jack" with a pretty diverse mix of music in its automation system. The station will, nevertheless, become Spanish once the testing's over. The all-Christmas station list we maintain over at 100000watts.com exploded this past week, as it's done in Thanksgiving weeks past, and here's who was added to the list in the Garden State: WWYY (107.1 Belvidere) made the flip, serving the Easton, Pennsylvania area, and so did WFPG-FM (96.9 Atlantic City). WJLK (94.3 Asbury Park) flipped as well, but only for the weekend, we're told. *In PENNSYLVANIA, all-Christmas flips included WBEB (101.1 Philadelphia), WLTJ (92.9 Pittsburgh), WWSW (94.5 Pittsburgh), WROZ (101.3 Lancaster) and - just across the state line from Erie - WREO (97.1 Ashtabula OH). There's a station sale to report: the Haddon family's Sunbury Broadcasting is paying $3 million to acquire WVLY-FM (100.9 Milton) and WMLP (1380 Milton) from Milton-Lewisburg Broadcasting. Sunbury's launching an LMA with the stations (which now do AC on the FM and talk on the AM) right away - and that apparently isn't sitting too well with the existing staff there, which has replaced the WVLY/WMLP home page with a message saying "We regret to inform our faithful listeners..." that the stations have been sold. NERW suspects there won't be much to regret, at least for listeners, as Sunbury's known for running a pretty good shop at its existing stations, WKOK (1070 Sunbury), WQKX (94.1 Sunbury) and WEGH (107.3 Northumberland). Down the Susquehanna River, Route 81's WHYL (960 Carlisle) has dropped its talk format. It's doing all-Christmas music as well, with a new format (likely standards) coming after the holidays. Christmas radio was all over the Empire State this week, including no fewer than four stations here in the Rochester market - Clear Channel's WVOR (100.5) and WISY (102.3 Canandaigua), Infinity's WRMM (101.3) and Entercom's WFKL (93.3 Fairport, one of the very few adult hits stations anywhere to go all-Christmas.) 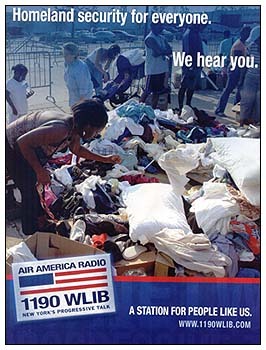 In the Binghamton market, WMXW (103.3 Vestal) made the flip, as did WTRY (98.3 Rotterdam) in Albany. Out on Long Island, WALK-FM (97.5 Patchogue) and WKJY (98.3 Hempstead) joined the crowd, as well. In Syracuse, the International League SkyChiefs have signed a new two-year radio deal that will return the baseball team to WNSS (1260). The SkyChiefs had spent the last few seasons with WFBL (1390), but the Buckley station moved many of last year's late-summer games to WSEN (1050) and WAMF (1300), which both have anemic night signals that barely reach the team's stadium. Two obituaries close out our New York report this week: in western New York, Edward "Eddy Jo" Joseph sang on the 1940 opening broadcast of WHLD (1270 Niagara Falls) and went on to become a DJ, then the station's PD and finally its general manager before he retired in 1979. Joseph died last Tuesday (Nov. 23) at 88. In New York City, Brijendra "Brij" Lal was known both as a longtime newswriter/producer at ABC Radio News and as a Sunday morning host of an Indian show on WFUV (90.7). Lal, who also worked for the Voice of America, died last Sunday (Nov. 20) in Ridgefield, Connecticut, at 81. *In MASSACHUSETTS, WAVM (91.7 Maynard) is fighting back against the FCC's tentative selection of Living Proof Inc.'s application to build a new station on 91.7 in Lunenburg. The move would prevent WAVM from upgrading to protected class A status, and would likely force the station off the air completely after 35 years. But the station, echoed by a letter to the FCC from the Maynard board of selectmen, argues that the FCC made a mistake - that WAVM's application to upgrade from class D to class A should have been treated as a minor change, which would not have opened it to competing applications. The station also argues that the FCC's process for choosing among competing applicants ignores the existing service provided by WAVM, which stands to be lost if the Living Proof application is granted. As we've said every time we've reported on this story, it's far from over - stay tuned. Another story that's far from over is the move of WAAF (107.3 Westborough) from Mt. Asnebumskit in Paxton to the WUNI-TV (Channel 27) tower on Stiles Hill in Boylston. The station's move to the new site a few weeks back apparently didn't go very well, judging by the reception reports we've been seeing. WAAF has returned to the Asnebumskit transmitter for the moment and has asked the FCC to withdraw its grant of a license to cover from the new site; we suspect there will be another act to this story soon. One Christmas addition in the Bay State: WMJX (106.7 Boston) joins the ho-ho-ho crowd this year. *A small RHODE ISLAND FM station has become the latest addition to EMF Broadcasting's "K-Love" network of contemporary Christian outlets. Chris DiPaolo is leasing WBLQ (88.1 Westerly) to EMF for three years; he's moved WBLQ's community programming to the former WCTD-LP (96.9 Ashaway), which drops its country format to become WBLQ-LP. Where are they now? Jeff Ryan, late of the Clear Channel Providence cluster, is now down in Philadelphia, doing weekends and fill-ins at country giant WXTU (92.5). *It's not a full-fledged format change, but CONNECTICUT's WDRC-FM (102.9 Hartford) has shed the "oldies" label and broadened its playlist of "hits of the 60s and 70s" a bit. Mark it down, we guess, as a classic hits outlet now. *It's all about Christmas radio in northern New England, too - in VERMONT, WEZF (92.9 Burlington) jumps on the train, as do NEW HAMPSHIRE's WHOM (94.9 Mount Washington), WLNH (98.3 Laconia) and WGXL (92.3 Hanover) and MAINE's WKCG (101.3 Augusta), WKSQ (94.5 Ellsworth) and WEZQ (92.9 Bangor). *It wasn't even a holiday in CANADA last week, but it sounded that way on at least a few FM dials. CJEZ (97.3 Toronto) and CHRE (105.7 St. Catharines) joined the all-Christmas crowd. There's another new signal on the air in Toronto. Humber College's low-power CKHL (96.9) signs on officially tomorrow (Nov. 29), promising the first 100-percent Canadian playlist anywhere in the country. And in Ottawa, Al Pervin signs on as GM of Evanov's new "Jewel 98.5," due to sign on in the next few months, reports Milkman UnLimited. We've got to say, we're especially proud of the way this year's calendar turned out. Once again, we bring you more than a dozen images from the fybush.com collection that have never seen print before, including that nifty nighttime view of New York's WMCA that graces the cover. You also get to see WSB, KTAR, Mount Wilson, CBV and many, many more, plus all those fun dates in radio and TV history, civil and religious holidays, a handy full-page 2007 calendar, and the always-popular hole for hanging.